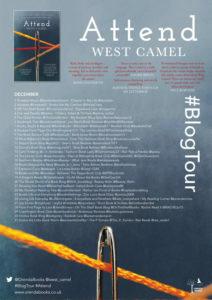 I’m so pleased to be posting as part of the blog tour for Attend by West Camel and I have a fabulous guest post by West to share with you today. My thanks to Anne Cater from Random Things Tours for the place on the tour. All my work has something to do with literature. When I’m not writing fiction, I’m editing it. And when I’m not doing that, I’m editing a magazine of European literature, or online reviews of the same. I also write reviews and features about books, and on occasion interview authors. So there is a lot of overlap in my working life, and it could get very messy. Over the years, however, I have made choices about which writer’s tools I use for which task, and these decisions keep me organised – as long as I stick to them. For my creative work – writing novels, short stories, plays – I always start by writing in long hand. Many writers I speak to are shocked that I work like this, but I find that holding a pen in my hand and putting my words on paper creates a closer connection between the ideas and images forming in my mind and the words I write. The paper I use for my creative work has to be a specific type: A4, loose leaf, narrow ruled, with a margin. A4, because I know how many words I’ll write on a page and can make a quick calculation of my progress. Loose leaf, because this makes the next stage of the process easier (see below). Narrow ruled, because I write on every other line and use the blank ones to makes changes. The margin is for comments, and questions and directions to myself. I always complete a first draft in this way – writing it with a black roller-ball pen. I seem to be able to write faster with these than any other type. All my other writing – reviews, features, blogpost, interviews – I do at the PC. And of course I always edit, check proofs, and perform all my other editorial work at a computer. However, I have a system of notepads for this work too. I always have an A6 notebook with me, preferably spiral bound, so it stays open. This contains my bulleted to-do list. I also always have an A5 notebook, again spiral bound. This is where I makes notes – at meetings, while I’m editing, while I’m on work calls, and at events I might be writing about. Finally I have a third notebook. This one I use only periodically, and for a very specific use. Essentially it contains a conversation with myself about my creative work. This is where I note down my first ideas. I then work through them in this book, asking questions, thinking about any problems and finding possible solutions. I’ll also use this notebook if I reach a difficult point in my writing. Rather than trying to work it out on the page of the work, I’ll work it out in this notebook – in a written conversation with myself. This collection of pens, pads and PCs has helped me organise my various literary tasks for a long time, as the overfull drawers of my desk demonstrate. And I don’t see myself changing my system anytime soon. Thank you, West. You’ve obviously found a way of working that really works for you. Long may it continue. Born and bred in south London – and not the Somerset village with which he shares a name – West Camel worked as an editor in higher education and business before turning his attention to the arts and publishing. He has worked as a book and arts journalist, and was editor at Dalkey Archive Press, where he edited the Best European Fiction 2015 anthology, before moving to new press Orenda Books just after its launch. 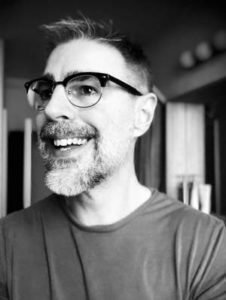 He currently combines his work as editor at Orenda Books with writing and editing a wide range of material for various arts organisations, including ghostwriting a New-Adult novel and editing The Riveter magazine for the European Literature Network. He has also written several short scripts, which have been produced in London’s fringe theatres, and was longlisted for the Old Vic’s 12 playwrights project. 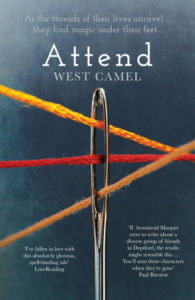 Attend is his first novel.